MJX Bugs 2w Review (in-depth) - Smart drone that you can afford ! Hello ladies and gentlemen, boys and girls… and welcome to a very special review! In this article, I’m going to present you with another awesome drone made by the folks over at MJX. After a huge success they had with their Bugs 3 drone which captivated plenty of users all around the world, they’ve gathered their forces and made a well-built upgrade that definitely has a fair amount of potential. MJX is definitely an up and coming drone brand. I’m sure most of you are familiar with their Bugs 3 model. They’ve had a fair share of success with it as it charmed the audience with its smooth flight and potential of being a great aerial photography platform when paired with a solid camera. Now, after collecting a nice bit of income from Bugs 3 sales, MJX has already finished making several new drones including the Bugs 2 series. There are 2 available models at the moment – MJX Bugs 2W and 2C. Even though they are relatively similar, there are certain differences which cannot go unmentioned. Considering this review will be focusing on MJX Bugs 2W, it’s only fair to give a small explanation related to the differences between these two. So, without further adue, let’s see what are these birdies all about! After getting you familiar with both versions of MJX Bugs 2, it is time to take a closer look at one of them. Of course, I aimed high and put the focus on MJX Bugs 2W, which is far more superior than the C version. So, with that said, let’s take a closer look at this small WiFi quadcopter and see what’s it all about! In addition to all standard specifications such as battery duration, operating range and camera, I’ll also give you some insights on how this birdie flies as well as give you a quick guide through its features. Finally, at the very end of this review, you will also get some info on where to look for spare parts as well as short (but informative) comparisons against 2 of its main competitors at the moment. So, let’s stop with the introduction and jump straight to action! If you’ve used MJX Bugs 3, then you will be familiar with the 2S 1800mAh LiPo battery that made its way inside. It’s a bit different design in question here, but it’s basically the same battery. If I remember correctly, MJX Bugs 3 could fly for up to 15 minutes on a single charge. Thanks to a slightly lighter body, MJX Bugs 2 can endure up to 18 minutes… although that time will be slightly lowered if you plan on recording during its entire length. But what I can confirm is that it goes beyond 500 meters for sure. Around the 500-meter mark, I lost my FPV reception so I had to click that Return to Home button in order to bring it safely back. This leads us to the FPV range which is thoroughly explained down below, right after the general camera info. In terms of camera, MJX has implemented a pretty good sensor. Similarly to the 2 models we’ll be comparing it against down below, MJX Bugs 2 sports a built-in camera with no hardware or software image stabilization. 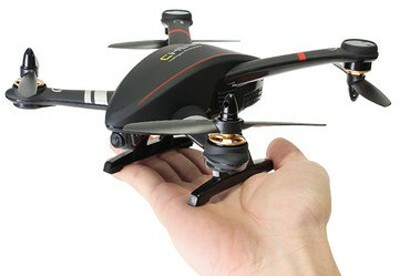 It can record aerial videos in 1080p resolution at solid 30 frames per second. When it comes to image quality, things are looking great as long as you’re recording in daylight and with no strong wind present. As far as stabilization goes, if your propellers are 100% balanced you will receive a perfectly smooth footage. This goes for windy weather too. Since MJX Bugs 2W has insane stability, its aerial footage greatly benefits from it, resulting in buttery smooth video and silky transitions. First person View (also known as FPV) is a really important feature that every modern-day camera drone needs to have. MJX Bugs 2W has access to FPV which makes it that much cooler. If we are to be more precise with our terminology, MJX Bugs 2 sports WiFi FPV. But it’s not your everyday 2.4Ghz WiFi that shuts down after just 20 or 30 meters. Nope! MJX Bugs 2W sports 5Ghz WiFi FPV connection which can extend over 500 meters. Sure, it’s not 5.8G analog FPV so you cannot expect a lag-free reception. Desite that, I’d say Bugs 2W FPV is still pretty acceptable. The best part, of course, is the massive range which will please all of you wanna be explorers, no doubt about that! Last but not least, let’s check out the brains of this beauty! MJX Bugs 2W has telemetry data which it feeds straight to that small LCD display on its controller. It’s rare to see telemetry at this price range, even in this limited edition which offers just a few information. Still, something is better than nothing as you will at least have information about current distance and altitude together with current GPS and 2.4G signal strength. One of the best upgrades that have come with MJX Bugs 2 is definitely the introduction of GPS module. Needless to say, that offered doors to many features such as return to home and altitude hold, both of which we’ll discuss further below. Return to home is always the first thing I examine when I get my hands on a new drone. When it comes to Bugs 2W, I was amazed by the quality. You basically have GPS return to home (which is pinpoint accurate, I can assure you) and standard return to home which works well to an extent. You cannot expect pinpoint accuracy with it since it is not relying on GPS, but it’s still useful for getting your drone out of sticky situations. Even though lots of people take this feature for granted (mostly because they haven’t tried an altitude hole drone yet), I have to tell you it’s one of the best things for beginners. It relieves the tension when you’re flying, allowing you to release the throttle without your drone slimming downwards in a dangerous manner. Instead, your drone will keep balancing out its props and remain stationary at a fixed point of your choice. Awesome, right? Like it was already mentioned above, the key difference between MJX Bugs 2W and 2C was 2W’s FPV capability. Of course, we are talking about mere WiFi FPV which is usually pretty bad; not only because of low range but because of input lag as well. When it comes to B2W, the FPV is actually quite nice for a WiFi-powered one. It doesn’t lag too much but, best of all, it works over 500 meters (once again, highly dependant on your smartphone) which is a rare occurrence for WiFi FPV systems. Usually, it requires 3 turns for completing both calibration processes. Once the compass calibration is completely your drone will have solid red light in the front and yellow/green in the back, depending on whether or not it has established GPS/GLONASS connection. The process of obtaining GPS/GLONASS connection with your Bugs 2W if pretty straightforward. It does so automatically without too much hassle. All you need to do is turn on both drone and its controller and successfully calibrate its compass. Once you are done with all that, simply leave the drone on the ground for a minute or two until its backlights turn from yellow to green. This will indicate it is connected to several satellites, number of which is located on the left side of your controller’s mini display. The controller of MJX Bugs 2W has a lot of keys that might seem difficult to understand at first. The majority of them is black with the only exception of lock/unlock (more commonly known as arm/disarm) which is colored brightly red. Right next to lock/unlock button you’ll find automatic takeoff and landing which provides great help to new users. On the other side, you’ll find the camera and return to home buttons. A single tap on the camera button will take a quick snap while holding it for 2 seconds will start recording. To stop recording you will have to long press the button again. Next to that, you’ll find return to home button which works after a single tap. 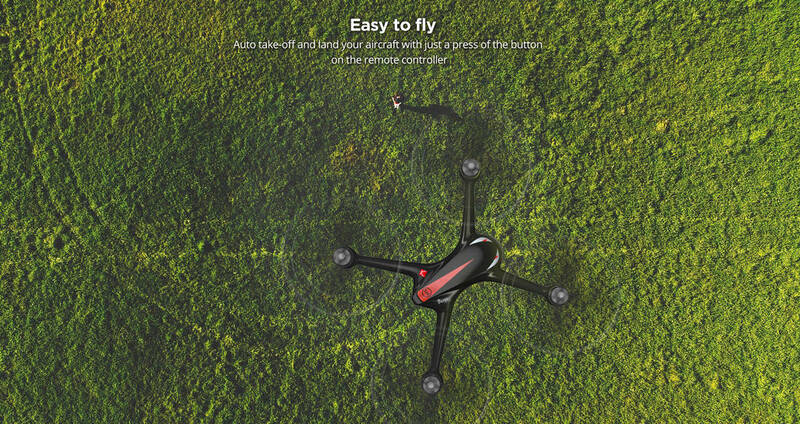 It will work with or without GPS connection and you’ll be able to take control over your drone at any time while return to home is active. There are also 2 switches on the front side of this controller. The left one is for turning GPS on and off and the right one is for headless mode. Lastly, the power switch is located in the middle of the controller and will light up green once it’s turned on. Setting up FPV with MJX Bugs 2W is also fairly simple. But, beforehand, you will have to make sure you own a smartphone that supports 5Ghz wireless connections. If you are not sure whether or not your smartphone supports it, simply go to GSMARENA and take a closer look at its wireless settings. If it has 802.11 ac then you’re good to go. 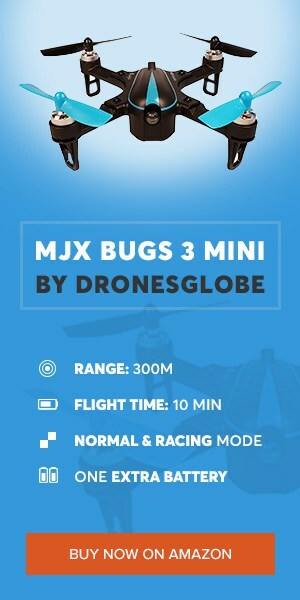 All you have to do then is download the official MJX Bugs GO app from Google Play or App Store and connect your smartphone to the drone’s WiFi. No password is required, simply tap on the name BugsXXX and you’ll be connected. Enter the app and tap on GO – you’ll see your camera’s point of view in a matter of seconds. First of all, you need to understand that both of these drones feature the same exact design. So, no different when it comes to build quality and aesthetics. However, there are slight differences in hardware inside. Even though they both sport roughly the same batteries, there’s a relatively big difference in charging time. While 2W charges up in 3 hours, 2C takes whopping 5 hours which is a bit too long for my taste. Furthermore, the biggest and most notable difference between these two is the fact that 2W model incorporates FPV while 2C doesn’t share the same trait. The story here is somewhat similar to Hubsan H501S and H501C, with the only real difference being in the FPV capability of the former. So yeah – 2W has access to a Wi-Fi app (works on both Android and iOS devices) which supports streaming of live footage straight from your drone’s camera. Other than that, everything seems to be pretty much identical. Now that we are done with the actual review portion of this article, it is time to do a few comparisons against other similarly priced models. To be more precise, there are 2 comparisons below that will put the performance of MJX Bugs 2W on the line against Cheerson CX 23 and Hubsan H501S. I’m sure most of you are aware both these drones offer great value for money. But, how does MJX Bugs 2W compare to them? That’s exactly what you will be able to find out in the next 2 paragraphs! If we are to look at these 2 drones side by side, we would be sure we’re looking at 2 same drones. They’re identical in terms of size but also look like one another in terms of their bodies and camera positions. But, don’t let that fool you – they are 2 very different drones. If I had to choose between one of these two, I admit that would be a pretty tough nut to crack. You see, their cameras are similar, their flight times are similar… but MJX Bugs 2W has significantly larger range. While Hubsan H501S can barely reach 300 meters, B2W goes up to 800 (or even 1000) with ease. However, Hubsan H501S has 5.8G FPV compared to WiFi on B2W. So, that’s a point for H501S. But… considering MJX’s drone is much faster and more agile, I think, at the end of the day, I’d settle for it. Another point for MJX Bugs 2W is its sattelite coverage. You see, not only does it sport GPS but GLONASS too, achieving more than 15 sattelite connections in most cases. Now let’s take a look at another top contender – Cheerson CX 23. First things first – camera on B2W is much sharper and generally provides better images and videos. That’s partially due to higher resolution sensor which captures 1080p instead of 720p, which is max resolution for CX 23. Moving forward, it’s also noteworthy to add that Cheerson CX 23 also possesses 5.8 FPV just like Hubsan H501S. While that will be a massive plus for people wanting a small FPV racer, for people who are more orientated to learning aerial photography, this will be a mere trivial matter. One thing you should definitely take into consideration is flight time. You see, MJX B2W can go up to 18 minutes while CX 23 sports 14 minutes at best… and that’s without FPV or camera being used. And finally, if we take a look at operating ranges of these 2 birdies, we’ll come to the conclusion that B2W wins the race in this department as well. That’s it, guys! With those 2 comparisons, I believe I’ve covered everything there is to know about this little bugger. So once again, I truly believe MJX Bugs 2 has what it takes to become an absolute champion in this price range. Like you had the chance to see above, MJX Bugs 2W is on point with Hubsan H501S and Cheerson CX 23, both of which are enjoying quite the popularity in this segment of drones market. So, what I am basically trying to say here is this – If MJX does a good job with marketing, I’m positive their MJX Bugs 2W review (and perhaps 2C as well) will get plenty of sales as well as satisfied customers who’ll spread the word of its awesome performance. If you’re planning on buying this drone and that’s how you stumbled upon this article, I’d like to say that you won’t regret purchasing MJX Bugs 2. It’s a fantastic little drone that doesn’t aim too high… but just enough to capture your attention and take you for a wild spin! Kudos to MJX and thank you guys for reading! FQ11 Review – Pocket size portable drone with 0.3MP WiFi camera. I have a question about the FPV or if you will streaming video. Will this unit transmit video to a smartphone or tablet that does not have the 5Ghz wifi feature? If so what smartphones works with the app. Just got the Bug 2w. It’s everything I’ve been reading and more. One problem hovever, I can not find and info on what size/type/brand of TF card to buy. Wish someone would include this info somewhere. 2:13 PMJanuary 18, 2018 Mike C.
I got one recently too. I haven't bought a TF car yet but I hear you need a class 10 card to record in 1080P video. I can tell you for a fact it will take a 16 gig SD card and I believe even a 32 gig as well. A class 10 SD card is what you're looking for. Hi, may I ask you what will be anticipated range of FPV if I have smartphone only with wifi 802.11 b/g/n? I received my Bugs 2W for Christmas but it did not come with the TF card. I bought a micro SDXC UHS-I card and put it in the drone but I can not get it to be recognized so, video does not get recorded on theCard, only on the APP. Can someone tell me how to properly use the micro card or tell me where to get the TF card that works in the Bugs 2W? you'll need to buy a SDHC microSD card. I apologise for not mentioning it in our review ! I bought a micro SDXC card to work in my Bugs 2W but it will not record. I only get recording on the Bugs app. How can I get the card to work OR can someone tell me where I can purchase a TF card that will work in my Bugs2W? My Bugs 2W did not come with the TF Card so I bought a SanDisk microSDXC UHS-I card and put it in my drone. I can not, for some reason, video on to the card. Any help in either getting the SanDisk to work or where I can purchase a TF card that does work would be greatly appreciated.